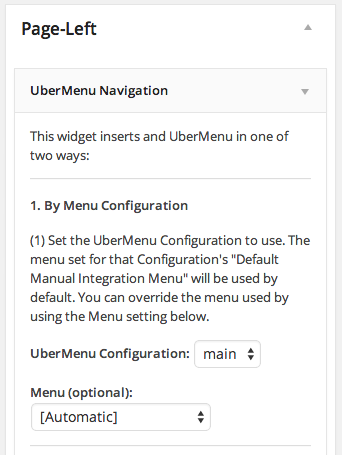 The easiest way to add UberMenu to a widgetized sidebar is to use the UberMenu Widget. If there is an existing menu, you can try Automatic Integration if a theme location is defined there, or you can use Manual Integration code to insert the menu directly into the theme’s sidebar template. If you want a main menu that is horizontal, and a sidebar menu that is vertical, and for both of them to be UberMenus, then you can create Multiple Configurations to configure the menus (and orientations) independently.